We understand the need for some very powerful, yet lighter recoiling 45-70 ammunition that can effectively take any game in North America and most of the world. When firing our magnum 45-70 ammunition in light handy lever action and single shot rifles, the felt recoil is often unpleasant for some shooters. Hence these new STANDARD PRESSURE, LOWER RECOIL 45-70 loads will fill a much-needed niche. These loads are “Standard Pressure”, which means they are operating within the SAAMI pressure limit of 28,000 CUP. Most cartridges do not have a straight line conversion from CUP’s to PSI, but conveniently, the 45-70 is a cartridge that basically does. So, regardless, 28,000 CUP’s will be roughly the same pressure as 28,000 PSI, in 45-70 cartridges. 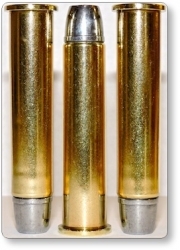 As standard pressure loadings, these cartridges are safe to fire in ANY/ALL 45-70 firearms except the 1873 Trapdoor Springfield’s and modern copies of such. We believe that SAAMI got it wrong with the 45-70 govt. cartridges, to state that 28,000 CUP is OK to fire in trapdoor actions. We believe you can damage the basic 1873 Trapdoor action (regardless of vintage) with loads that exceed 20,000 CUP. We are not stating that you definitely will damage Trapdoor actions with ammo that runs 28,000 CUP, but we know that it can happen, so while this ammo is operating at or under the SAAMI limit of 28,000 CUP, we warn against using it in the 1873 Trapdoor Springfield action or modern reproductions thereof. Felt recoil is a moving target, because of the word “felt”. We recommend that you read our essay about felt recoil in order to understand the context of what I am writing on the subject. What can be said of felt recoil with handguns, also translates to rifles. Having said that, when firing this Lower Recoil ammo in a typical Marlin Guide Gun that weighs 6.5 lbs., I personally feel a recoil reduction of approximately 40+% from our Magnum 45-70 loads, that use the same bullets. These loads are not pipsqueak by any means. They are serious hunting loads and in the case of item #8H, it is a dangerous game stopping load. What I mean is that our item #8A, utilizes the same bullet (a 430gr. hard cast, gas checked bullet) as this new lower recoil item #8H, but item #8H is generating around 350 FPS slower velocity—and even at 1550 fps, this bullet will penetrate nearly lengthwise through a 2,000lb buffalo. In fact, my wife has been shooting this item #8H in her Marlin Guide Gun for nearly 6 years, which at this writing (01-29-15) was six years before I introduced this load to the public. She weighs only 105 lbs. and cannot handle the recoil of item #8A, which generates around 1900 fps, so I developed this load just for her and it was so effective, I decided to produce and sell it to the shooting public, along with three other “Lower Recoil” loads. Our goal was to design these loads so they stayed at or under the SAAMI 28,000 CUP limit but still operate with a slightly compressed powder charge in order to keep recoil in a magazine tube rifle, from battering the bullets deeply into the casing. After much testing, we discovered the proper powder to do this with each different bullet. 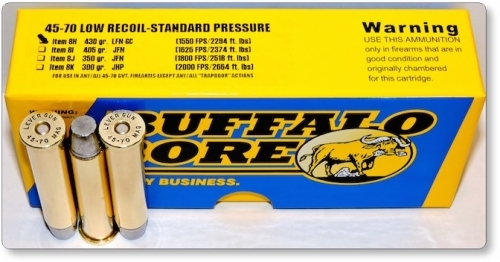 Now you’ll get a very powerful load for hunting big game, greatly reduced felt recoil/report, ammo that cannot be battered too deeply into the case from recoil in a magazine tube and is safe to use in all 45-70 firearm designs, except for possibly the trapdoor action in its various iterations. Item #8B (Magnum 45-70, 405 gr. JFN) = roughly 2000 fps in a 22 inch Marlin, but it’s Lower Recoil counterpart of item #8I produces 1630 fps in the same rifle and 1585 fps in an 18.5 inch Marlin Guide Gun. Both the Magnum and Lower Recoil versions are designed to kill game animals of up to 800 lbs. This is a somewhat soft bullet that mushrooms greatly on game animals and penetrates around 30 inches in living mammalian material. Item #8C (Magnum 45-70, 350 gr. JFN) = roughly 2150 fps in a 22 inch Marlin, but it’s Lower Recoil counterpart of item #8J produces 1845 fps in the same rifle and 1762 fps in an 18.5 inch Marlin Guide Gun. Both the Magnum and Lower Recoil versions are designed to kill game animals in the 1500 lb. class and yes this 350gr. JFN bullet out-penetrates our 405gr. JFN bullet, due to its tougher construction and therefore smaller mushroom—expect around 48 inches of penetration in living flesh and bone. Item #8E (Magnum 45-70, 300gr. JHP) = roughly 2350 fps in a 22 inch Marlin, but it’s Lower Recoil counterpart of item #8k produces 1979 fps in the same rifle and 1879 fps in an 18.5 inch Marlin Guide Gun. Both the Magnum and Lower Recoil versions are designed to kill game animals up to the 300-400 lb. class. This is a lightly constructed bullet that mushrooms violently, makes an enormous wound cavity and penetrates up to 24 inches in living game animals. My Brothers and son took our father on a Bison hunt with his Shiloh Sharps military rifle in 45-70. He had always wanted to take a Bison with the rifle. After getting in position at 25+ yards I waited for a broadside shot and for the other bison to be clear. I fired one round of Buffalo Bore 430gr - 8H which went through both shoulders and hitting both lungs. I aimed straight up the front leg in the middle third of his body. He walked less than 10 yards and went down. During the processing you could see the entrance broke one rib and broke another rib on the exit but tracked straight across the Bison. The ammo also proved to be very accurate when zeroing before the hunt. I was able to shoot a 1" group from the bench and a 2" group off shooting sticks from 100 yards. Thanks again for the great ammo and customer Service. I talked to many people on the Marlin Gun forums. They recommended your company to purchase my ammo for my Buffalo hunt. When I contacted you, you recommended the 8A or the 8H. I decided to go with the 8H to be on the safe side. I ordered and received them in about 4 days. I went on December 15th, 2018 for my hunt. I am using a Marlin LTD 45.70 open sites. I end of taking a Buffalo around 1,100 pounds. It was approximately around 40 yards or so. I hit the bull in the neck below the ear. The Bull dropped, and that was it. The bullet went completely through the neck. I was really impressed with the performance of the bullet. I am glad for the referral to your company. 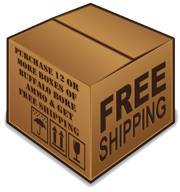 I will be ordering more ammo in the future from you.